Moving home is stressful enough even at the best of times but if you have a baby in tow it will place even more demands on you. And, even though a baby will seem more oblivious to everything that is going on far more than toddlers might, they will nevertheless pick up upon your vibes as it gets nearer the time to move. The good news, however, is that there are steps you can take to make the transition go smoother and, whilst all of the options outlined here may not be available to you for one reason or another, some of the advice given might help make moving day seem just a little more manageable. Obviously, if you’re in a position where it’s not going to be too difficult to pick your baby up once you have settled in to your new home, you should try to arrange to leave them with a grandparent, a trusted friend or relative, or a reputable baby sitter in their home whilst you go about your business of moving the rest of your family from your old home to the new one. Of course, this might not always be practical if you are moving a long distance or overseas but it is the best course of action if it can be achieved. If it’s not possible however, here is some other useful advice. If you are moving a long distance and are driving, then it’s highly likely that baby will be coming with you. Before moving day, you should plan your route carefully and build in some appropriate rest stops along the way. Not only is this important to give you a breather from driving but it also serves a purpose for enabling other small toddlers you might also have travelling with you to get out of the car and stretch their legs too and, in addition, your baby will welcome some fresh air and it will also be a more suitable opportunity for feeding time. With a little luck, your baby might sleep the whole way through the journey but it’s always best to be prepared for the worst eventualities so, when planning your route, also make a note of where the nearest hospitals are at any given point along the route, in case of emergency. Also, if you think it necessary, it’s useful to have your baby checked out by your GP before you travel to assess its fitness to travel, particularly if it’s an arduous journey ahead and especially if you’re heading overseas where things like making sure vaccinations are up to date will be crucial. Fingers crossed – your baby might decide to sleep for the duration of the trip but, just in case, it’s useful to make a few plans to keep them occupied if they’re awake during the journey. Favourite toys obviously help to keep them amused and, in case they get agitated, it might be useful to record a couple of CDs that might help to soothe them. You could make recordings of their favourite nursery rhymes, you singing, other sounds from the house that soothe them e.g. the sound of the vacuum cleaner or a fan whirring might be familiar sounds that comfort them and though the thought of listening to a CD of a vacuum cleaner in action might be cause for you to tear your hair out, better that then having a screaming, agitated baby all the way through the journey. 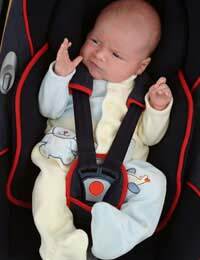 Hopefully, many of the precautions and tips here might not be called for and baby might not even wake up until you reach your destination but, as you’ll no doubt be only too aware – it’s better to come prepared than to suffer even more stress because baby gets agitated throughout the entire trip.